Thanks to Brian Kalet for his trip report, which inspired this outing. 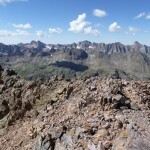 The San Juan range between Durango and Silverton contains some of Colorado’s best peaks. 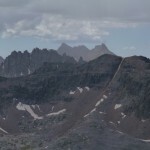 They are also some of the most difficult to reach, for several reasons: First, unlike most areas of western Colorado, they were not extensively mined, so there are few dirt roads leading into the area. 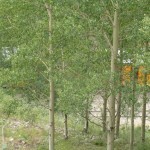 Second, the Animas River lies between them and highway 550, so any approach starts with a 1000- or 2000-foot descent. 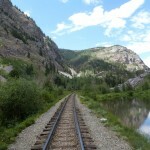 Finally, the train along the Animas runs infrequently and costs $100 to ride. This is why, although I have driven by these peaks many times, it has taken me until now to tag some. 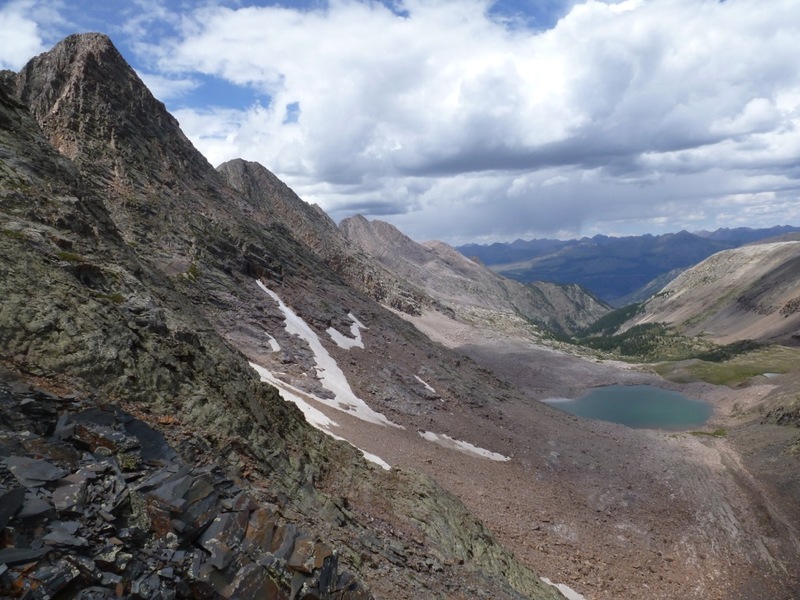 Vestal Basin is reached by descending the trail from near Molas Lake to the Animas, then taking the Elk Creek trail to an unmarked turnoff near a large, green lake, and following the fairly obvious use trail. 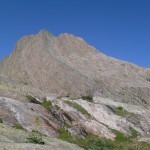 The peaks south of the basin are all made from the same solid, multi-layered rock, which was uplifted and bent, then cut. 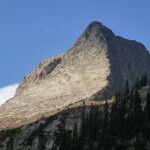 Oddly, Arrow, Vestal, and the Trinities have almost no connecting ridge-line, but instead are nearly separate peaks on a high bench. Vestal and Arrow in particular are striking and distinctive, and Vestal’s Wham Ridge is a classic moderate route (5.4, supposedly). 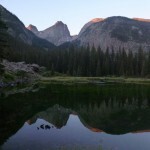 I got a proper alpine start at 4:05 AM, jogging what I could of the trail down to the Animas. The trail starts to drop, then heads slightly uphill and north while crossing what turned out to be a large meadow; this seeming detour was disconcerting on a moonless night. It was still full dark when I reached the bridge, startling a deer near someone’s tent. After hiking along the tracks a short ways, I found the Elk Creek trail and began regaining my lost elevation. Elk Creek is freakishly popular: I came across one person camped right along the trail, and a virtual tent city at the Vestal Basin turnoff. Oddly, I only met a single backpacker in the basin itself; I’m not sure what all those other people were doing. The turnoff is obvious if you know what to look for: there is a large, nasty-looking lake south of the trail, and you can see the tops of Arrow and Vestal up the side valley. 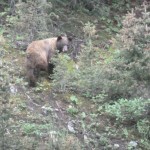 After seeing my first bear of the day, I must have turned my brain off on the steep climb into Vestal Basin, because I went right past Arrow and Vestal, then had to backtrack for a few minutes, cross the stream, and follow a faint trail through grass and slabs to the bench at the base of the peaks. The previous evening’s rain (vicious hail on Molas Pass) had collected on the bushes, thoroughly soaking my pants and shoes. 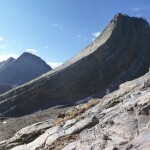 The only route description necessary for Arrow is “use the huge ramp that God provided.” The bent layers have broken off in several clean ramps, one of which leads nearly to the summit. Though there’s some 3rd class scrambling at the top, most of the climb is a walk up perfect slabs. The descent is equally pleasant and straightforward. After tagging Arrow, I cut across to the base of Vestal’s west side, then found a place to pop over to its signature north face. The Wham Ridge route simply stays near the right-hand side of this face, leading nearly to the summit. 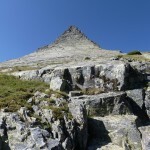 Most of the climbing was class 2-3, with a few harder spots where the face steepens near the top. I thought it could go at class 4 with some deviations from the ridge; there is very little 5th class climbing, none of which felt quite 5.4. 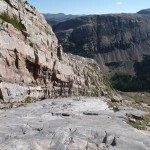 It is still a fun route, but you should not expect a sustained technical climb. After descending off Vestal via a nasty talus slope on the southeast side, I followed a faint path on the ridge to the base of West Trinity. Some uneventful 3rd class climbing on the southwest ridge got me to the summit, where it briefly looked like it might start raining. 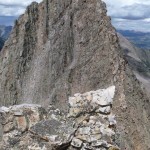 The traverse to Middle Trinity requires avoiding a couple of sub-summits, and mostly follows ledges on the south side of the ridge. 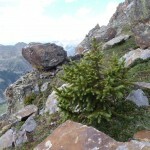 Like Kalet, I marveled at the lone tree somehow growing above 13,500′ on this traverse. 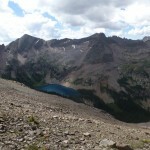 Having stayed too low too long, I had to do a bit of unpleasant wet slab climbing to reach the summit bowl. 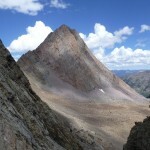 The east side of Middle Trinity consists of a number of ribs and scree gullies; the one closest to the ridge reaches the saddle with minimal loss of elevation. East Trinity’s west ridge was a surprising treat, a fun 3rd class scramble on solid quartz-like rock. 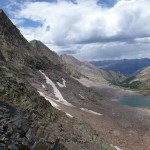 I continued east to where the ridge splits, then headed down and left to the head of Vestal Basin. 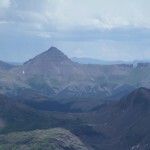 After sliding down some well-behaved scree, it was just a matter of putting in the miles back to Molas. 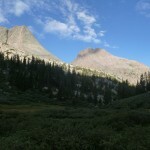 I stayed north in the basin until I was even with Vestal, then dropped to the trail, avoiding most of the bushwhacking. After jogging most of the trail down to the Animas (meeting my second bear) and just missing the train, I ground out the long, switchbacking climb to the trailhead for a car-to-car time just under 12 hours.